Own Deadpool - Action Notebook from Deff, DVD, Blu-Ray & 4K Video Specialists - Free UK Delivery..
Own Deadpool - Comic Insufferable Mug from Deff, DVD, Blu-Ray & 4K Video Specialists - Free UK Delivery..
Own Deadpool - Nerd Mug from Deff, DVD, Blu-Ray & 4K Video Specialists - Free UK Delivery..
Own Deadpool - Unicorn Mug from Deff, DVD, Blu-Ray & 4K Video Specialists - Free UK Delivery..
Own Deadpool 1 / Deadpool 2 DVD from Deff, DVD, Blu-Ray & 4K Video Specialists - Free UK Delivery..
Own Deadpool 2 4K Ultra HD from Deff, DVD, Blu-Ray & 4K Video Specialists - Free UK Delivery..
Own Deadpool 2 DVD from Deff, DVD, Blu-Ray & 4K Video Specialists - Free UK Delivery.. Hold onto your chimichangas, folks. 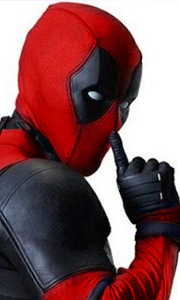 From the studio that brought you all 3 Taken films comes Deadpool, the block-busting, fourth-wall-breaking masterpiece about Marvel Comics’ sexiest anti-hero: Me! Go deep inside (I Love That) my origin story... typical stuff...rogue experiment, accelarated healing powers, horrible disfiguremnet, Red Spandex, imminent revenge. Directed by overpaid tool Tim Miller, and starring God’s perfect idiot Ryan..
Own Deadpool Dirty Doormat from Deff, DVD, Blu-Ray & 4K Video Specialists - Free UK Delivery..
Own Deadpool Mug Gift Set from Deff, DVD, Blu-Ray & 4K Video Specialists - Free UK Delivery..
Own Deadpool - 2 Thumbs Red Mug from Deff, DVD, Blu-Ray & 4K Video Specialists - Free UK Delivery..
Own Deadpool - Comic Mug from Deff, DVD, Blu-Ray & 4K Video Specialists - Free UK Delivery..
Own Deadpool - Family Mug from Deff, DVD, Blu-Ray & 4K Video Specialists - Free UK Delivery..
Own Deadpool - From Awesome To Gruesome Mug from Deff, DVD, Blu-Ray & 4K Video Specialists - Free UK Delivery..
Own Deadpool - Insufferable Mug from Deff, DVD, Blu-Ray & 4K Video Specialists - Free UK Delivery..
Own Deadpool - Off The Page Mug from Deff, DVD, Blu-Ray & 4K Video Specialists - Free UK Delivery..
Own Deadpool - Royalties Mug from Deff, DVD, Blu-Ray & 4K Video Specialists - Free UK Delivery..
Own Deadpool - Shooting With Style Mug from Deff, DVD, Blu-Ray & 4K Video Specialists - Free UK Delivery..
Own Deadpool - Smoking Gun Mug from Deff, DVD, Blu-Ray & 4K Video Specialists - Free UK Delivery..
Own Deadpool - Splat Mug from Deff, DVD, Blu-Ray & 4K Video Specialists - Free UK Delivery..
Own Deadpool - Splat Travel Mug from Deff, DVD, Blu-Ray & 4K Video Specialists - Free UK Delivery..
Own Deadpool - Tis The Season Mug from Deff, DVD, Blu-Ray & 4K Video Specialists - Free UK Delivery..
Own Deadpool 1 / Deadpool 2 Blu-Ray from Deff, DVD, Blu-Ray & 4K Video Specialists - Free UK Delivery..
Own Deadpool 2 Blu-Ray from Deff, DVD, Blu-Ray & 4K Video Specialists - Free UK Delivery..